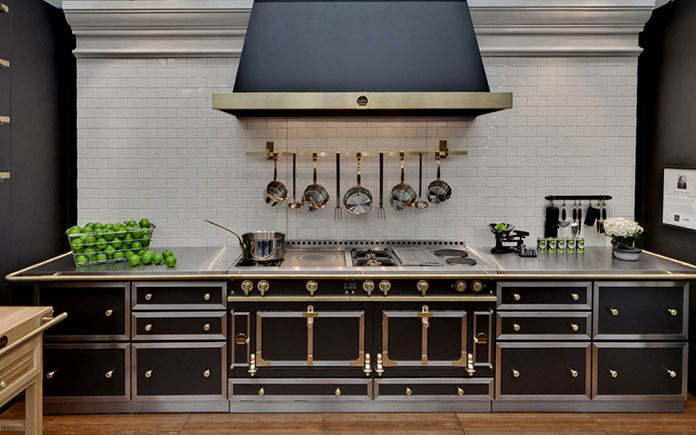 The launch of a new La Cornue range is a veritable happening in the culinary world. 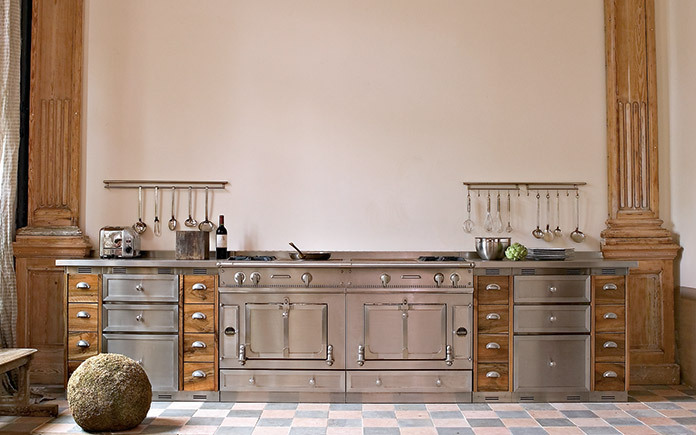 107 years after the invention of the vaulted oven, La Cornue is once again astonishing the world’s gourmet stage with an innovative patent for a revolutionary gas oven system. 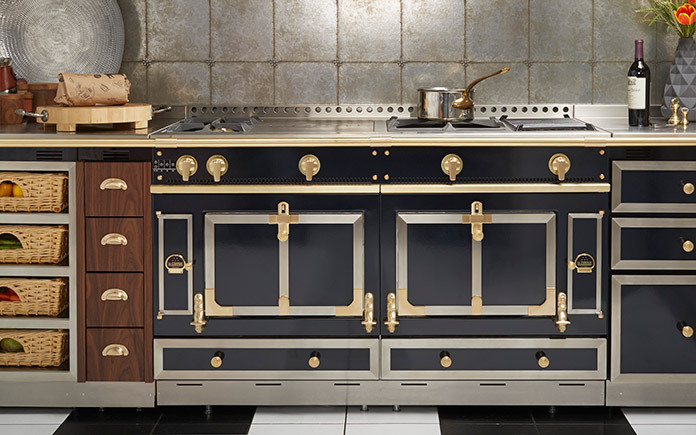 Modestly called Chateau G4, as in the fourth generation of La Cornue vaulted ovens, this oven uses every mode for gas cooking: radiation, convection and conduction. In the G4 oven, the traditional gas burner tube has been replaced by an entirely new assembly. A very powerful circular burner, very economical in terms of energy consumption, is located inside an open oven floor. A cast iron disk glazed with amorphous graphite sits on top of the burner. Simultaneously diffusing the heat and guarding it, this disk ensures extremely regular distribution of hot air in the oven in three distinct ways. Firstly by conduction when, for example, a casserole dish is simmering directly on top of the disk. Secondly by natural convection with discreet circulation of hot air and finally by radiation as the heat reflects of the oven’s interior walls. 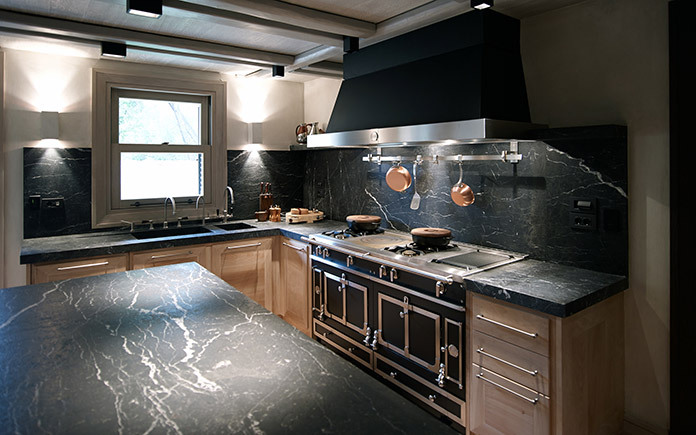 No other gas oven can offer as many cooking methods, from simmering at low temperature to grilling food under an electric grill with combinable zones. Three years of research and development were required to design and manufacture this range. A patent has been filed for the invention of this exclusive device, called the RCC disk. The new G4 electric oven has also equipped itself with a plethora of improvements offering cooks the choice of four cooking modes: forced convection, grill, oven floor and floor-vault combination. Together these improvements and inventions in one unique range propel the Chateau G4 to the very peak of culinary technology. It is important to remember that the vaulted oven allows air to circulate naturally and evenly, guaranteeing moist food and unrivalled flavour. To ensure the best possible humidity levels, the oven’s seal is ensured by a new door with an inner ceramic coating. With a low-temperature door, this also makes the outside of the oven even safer. Another advantage is that there is no significant drop in temperature when opening the door. All these technological solutions in the new gas and electric ovens mean they perform even better. The temperature rises extremely fast: the gas oven reaches 200°C in only 8 minutes and the electric oven in only 13 minutes (forced convection). Temperature settings are exceptionally precise and go up to 275°C. Extremely economical, the new ovens already comply with the 2020 Eco Design European Standard as they have an A energy label. 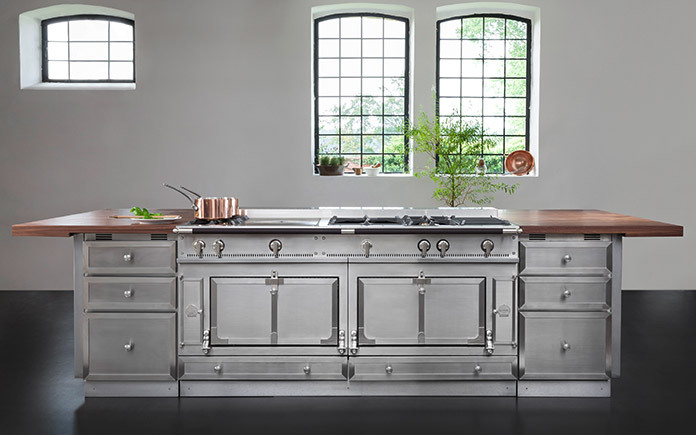 A genuine technological and gastronomic jewel, the new G4 ranges are, as they should be, proudly and individually manufactured in France by our craftsmen in our workshops at Saint-Ouen-l’Aumône. The Chateau G4 range has 8 models, from 75cm to 180cm wide. 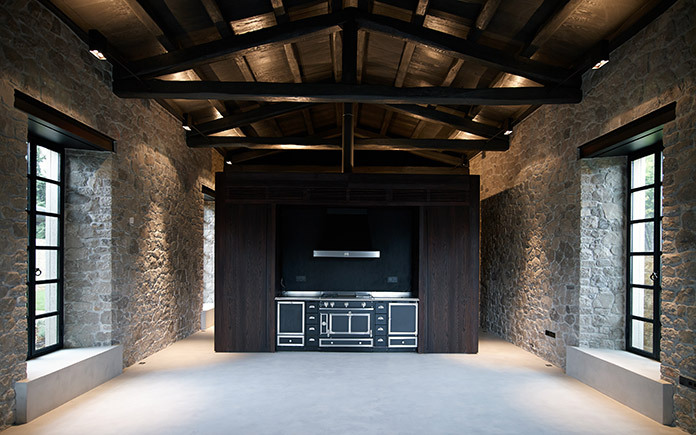 From 120cm wide and above, the ranges have two vaulted ovens, one gas and the other electric respectively for meat and pastries. 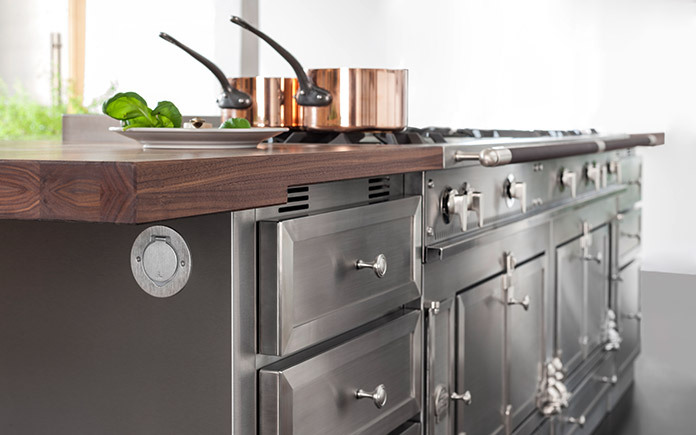 Each Chateau range also comes with a hob that can be customised to suit individual cooking preferences. The Chateau G4 is available in 29 colours, including the new greige, and 12 coating finishes. Many style and material options are available, like carbon fibre for example. Around 1,000 units are manufactured every year in our Parisian workshops. Each one remains the original, numbered work of one La Cornue craftsman. 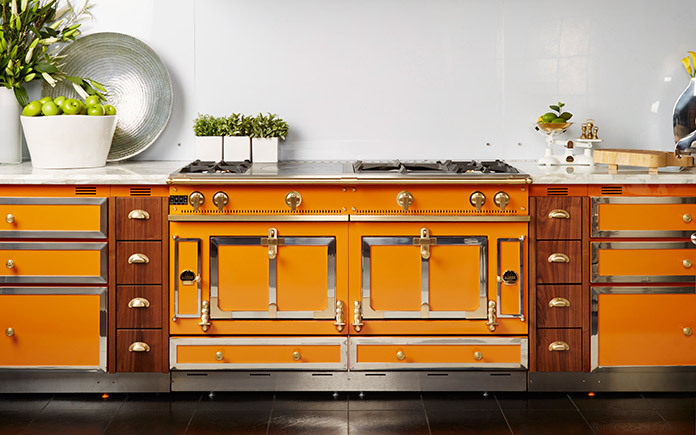 Ordering a La Cornue range is a creative event. Every demanding customer will find a combination to create his or her unique range.